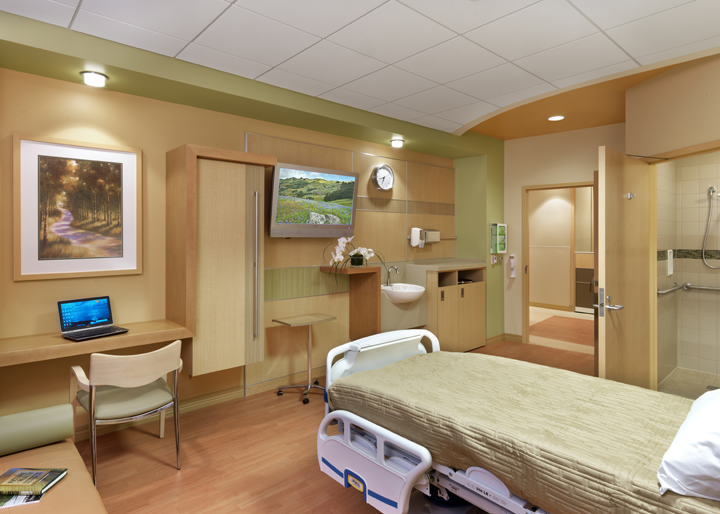 Home » Opinion » Are Healthcare Architects Phobic About Color? 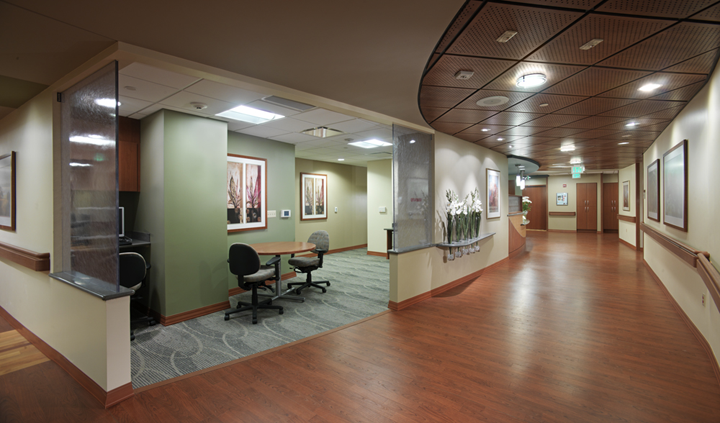 Many new hospitals are bland, having little color and few design amenities especially in patient care areas. The lobbies are beautifully detailed but, after leaving the lobby, many buildings resemble the “pre-Planetree” 1970s and early 1980s with an institutional ambience—lots of “infinity” corridors with white walls, lay-in acoustic-tile ceilings, standard fluorescent luminaires and incidentally, poor wayfinding, since where you are standing looks just like where you’ve been and where you will be going. How did this happen after all that we have learned about the importance of creating settings that reduce stress? And why does this matter? Stark white walls, harsh lighting, noise, and an overall lack of comfort are incompatible with a healing, nurturing environment. It’s interesting to note that the brain perceives the environment consciously and subconsciously causing it to increase or decrease the concentration of physiologically active hormones that have the capacity to negatively impact the healing response. Consider this: even when a person is not consciously thinking about the interior design and comfort level of the setting, the brain is responding to it subconsciously. According to neuroscientist Dr. Bruce Rabin, stress impacts coping skills and the inability to cope results in the increased use of medications for pain, sleep, and anxiety. When sleep is interrupted, muscle tension, blood pressure, and heart rate increase in response to stress. Stress-reactive areas of the brain become activated resulting in elevated levels of stress hormones in the blood. There is relatively little in a hospital that does not cause anxiety and stress therefore the built environment needs to be designed to mitigate the negative impact of it. Nurse Pod at the Benjamin & Marian Schuster Heart Hospital, Kettering, OH. Designed by Jain Malkin Inc. Think about the spaces you design. 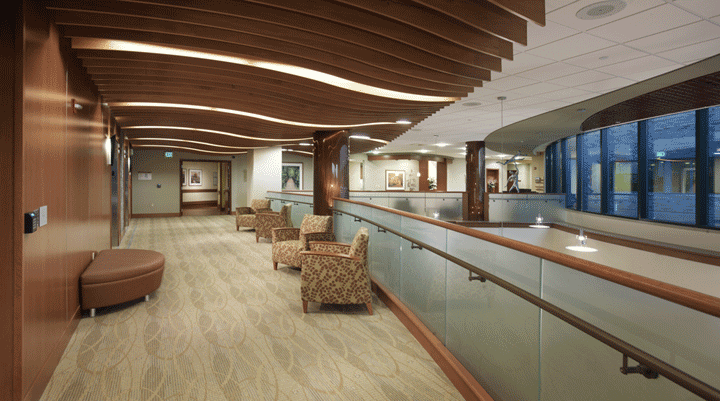 Are you carrying design details from the lobby into areas where patients spend their time? Into nursing units, patient rooms, procedure rooms, diagnostic imaging? Are you selecting art images that exemplify the best research as to what is restorative? White walls are great for museums, but not for hospitals. Color is the elixir of life, it energizes us, makes us feel good. Don’t be afraid of it! Elevator Lobby at the Benjamin & Marian Schuster Heart Hospital, Kettering, OH. Designed by Jain Malkin Inc.
Rabin: “From PsychoNeuroImmunology to PsychoNeuroArchitecture.” Keynote address: Healthcare Design 04, Houston, TX. November 9, 2004. Rabin, B. 1999. Stress, immune function and health: the connection. New York: Wiley−Liss.